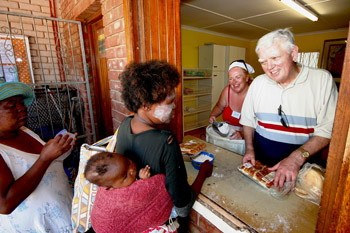 The Nutrition Unit helps the people of Missionvale each day by providing them with a half loaf of bread and a scoop of nutritious soup powder making it possible for them to go home and provide a meal for their family. This service is available to any one in need. 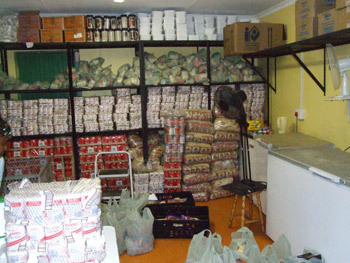 The Nutrition Unit also distributes weekly food parcels to those families on the Care Centre adopted list. A food parcel provides additional items of sustenance for a family including sugar, tea, rice, pilchards, baked beans, potatoes, onions, body soap, and dish soap. 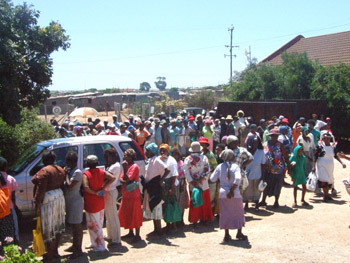 Approximately 700 food parcels are given out each week. This nutrition program is an extremely important for all the people that participate as well as being able to further help those who are sick. It provides the basic substances that people need on a daily basis. Without proper nutrition, a person cannot take the necessary medication they may need to take to improve their health. Missionvale Care Center has created a recycling program as part of the food distribution process. This recycling program serves three purposes. First, each person requesting bread and soup is asked to bring empty tins to be recycled. This teaches the people self-respect, the food is not a hand out, they must do something for it. Second, this is a way to have the people help clean up the areas and less garbage is created. Third, the Care Centre receives a small amount of money from the recycling company to help pay for some of the bread and soup powder each day.